Suffolk Naturalist: A record and a reward! Well, last weekend was a lovely weekend down here in Suffolk. Lovely warm weather with blue skies and little wind saw us all basking in the heat. I was enjoying it too thinking what it would mean for the moth trap that I was going to put out on the Saturday night. I could hardly wait and kept checking the weather reports on a regular basis to see what the overnight weather was going to bring. Warm temperatures, around the 15ºC mark and cloud cover with little wind was forecast and is ideal moth trapping weather. Saturday night came and the cloud wasn't fully overcast, but it was still good and warm. Just a little cloud with a nice wavy pattern. So it was time to set the moth trap up to see what was flying tonight. Moth trap set, bring on the moths. As you can see from the above photo, I lay my trap on a white sheet. This helps reflect the light upwards and gives the moths a nice large target to aim for. The egg trays laying up against the trap are there for any moths that are struggling to get into the trap. Many moths land outside the trap and spend a lot of time whizzing round and round the outside banging against the side of the trap. The egg trays give the confused moth refuge and helps to quieten them down. I also pin up a sheet to the side of the trap against the fence. Again, this is to spread the message by reflecting light a bit further away than just a bulb. I find it works as usually, as in the morning when I inspect the trap I find a lot of moths on both sides of the fence sheet. Come 9 pm I popped out to see what was being pulled in to the light only to find it all still very quiet and not much happening. I then checked again 30 mins later to find a moth on the fence sheet. However, the moth turned out to not be a moth at all, but a beetle instead, a Summer Chafer Amphimallon solstitialis. It's very much like a Cockchafer Melolontha melolontha but smaller and it was the first time I had seen one. Then, again after 30 mins I was back outside like an eager school boy waiting to see what presents had been left. What I saw was amazing, the moths were swarming around the moth trap and I had to watch my every step to make sure I didn't tread on any. Already I could see an Elephant Hawkmoth Deilephila elpenor in the trap and also a Hawkmoth that thought he was just too good to be in the trap and found a nice place to sit by the pond instead. A beautiful Poplar Hawkmoth Laothoe populi takes a rest on the bullrushes. I didn't disturb him from his rest and he remained in the same place till the following night. My niece Gabby was pleased to see it the following and commented that it looked like a leaf and when I asked her did she know the reason why it looked like a leaf, she replied immediately with, so the birds won't see it and kill it. Spot on and she's only 6. So, the moths were gathering and I went off to bed knowing I was in for a busy day identifying them on Sunday. I awoke without the aid of an alarm clock (unusual for me) bang on 4am. The first thought that entered my head was, better get up and sort the trap out. Very quietly so as not to disturb wifey, I slipped out of bed and straight down stairs with my pots, notepad and ID books and insect net thinking this'll take me an hour and then I'll pop back to bed. The site that greeted me was amazing, there were moths everywhere and I was at a loss as to where I should start. Sadly, I wasn't awake enough to think about taking a photo, I'll try better next time. I eventually pulled myself together after making a cup of coffee and started by sorting out the moths outside the trap on the floor, nearby plants and the back of the house. Then I moved onto the sheet against the fence before attempting the egg trays around the trap. Those moths which I could identify easily were made a note of and released into nearby vegetation. Those which I was 100% sure on I gave a quick look in the book to see if I could get an ID and once ID'd, again were released. Those that I couldn't ID with ease were potted ready for identifying later. Some of the pots I use for potting my moths for later identification. Once all the moths were potted 3 hours later (so much for going back to bed) they were placed in the fridge. Now don't worry, this doesn't harm them and to them it's just like a sudden chilly spell. By placing them in the fridge, it slows their metabolism down and the don't beat themselves silly trying to escape. On one night last year I had just over 200 moths, unfortunately, I didn't write it all down. Or I did, but the scrap of paper I wrote it on has since long disappeared. I knew that this trapping was going to be another 'big one' and I wasn't wrong. 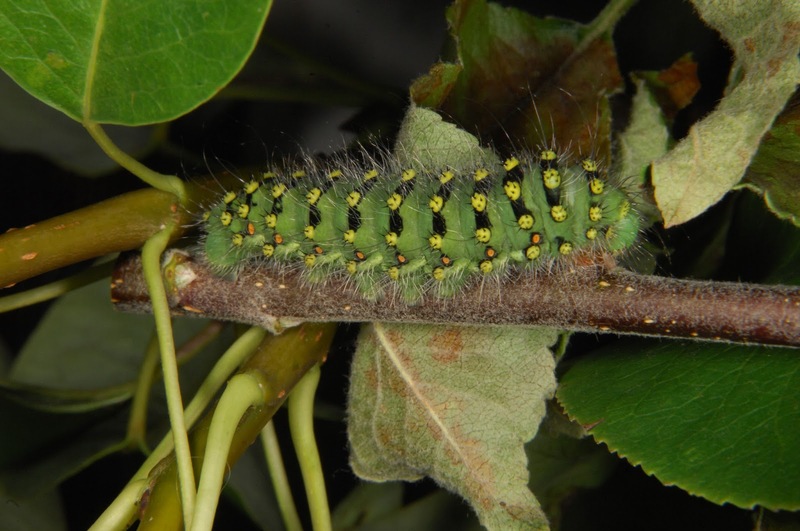 The final count was a whopping 295 moths, 73 species! Wowzer! Yes, I got a reward for my efforts too. You'll notice from the list above that of the 10 Hawkmoths captured, 6 were Elephant Hawkmoths. Well one of these left me a present of 8 little green sticky eggs in the holding box. Elephant Hawkmoth D. elpenor eggs. I would also like to say at this point a big thank you to the little Twitter community that helped me ID the harder moths @dorsetmoths @MarkG76 @Stewchat @The LilacGrove @dominicpic @inkednaturalist @AojandTheHounds @julabell1 @dragonandonion @MarkHammond @David_W_Gibbons@CupidoMinimus and anyone else I forgot to mention, Thank You! "It's definitely not one of those!" Now with go faster orange dots. They are now happily munching on pear leaves after the wifey commented on how much the apple tree had 'shrunk' over the last few days. I also managed to 'acquire' some heather from my mother's front garden and have place that in the flexarium. They don't seem to interested in it and prefer to munch on the pear leaves for the time being. Soon I will be placing some twigs in the flexarium for them to start spinning their cocoons which will see them through the winter. Quite a colourful caterpillar which over winters underground as a pupae. 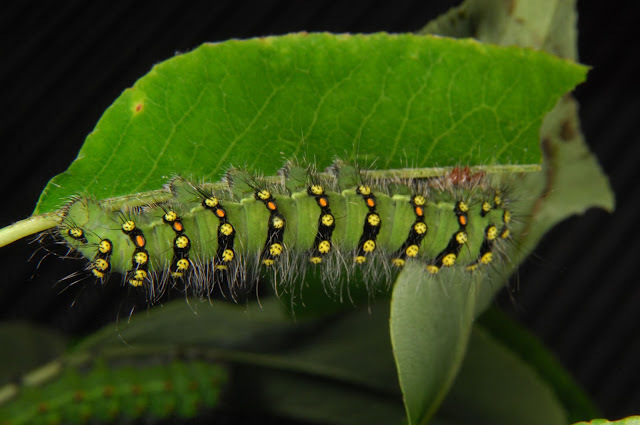 These have been known to spend up to 5 years underground as pupae and is the longest part of their lifecycle. I could only find one of these on my rather large buddliea and I only found one on the same plant last year, which suggests to me that the adult moth only lays eggs singularly instead of in batches. Another strange thing is that I've not caught a Mullien moth in my trap so far this year. I also found this little bunch of guys on a leaf. 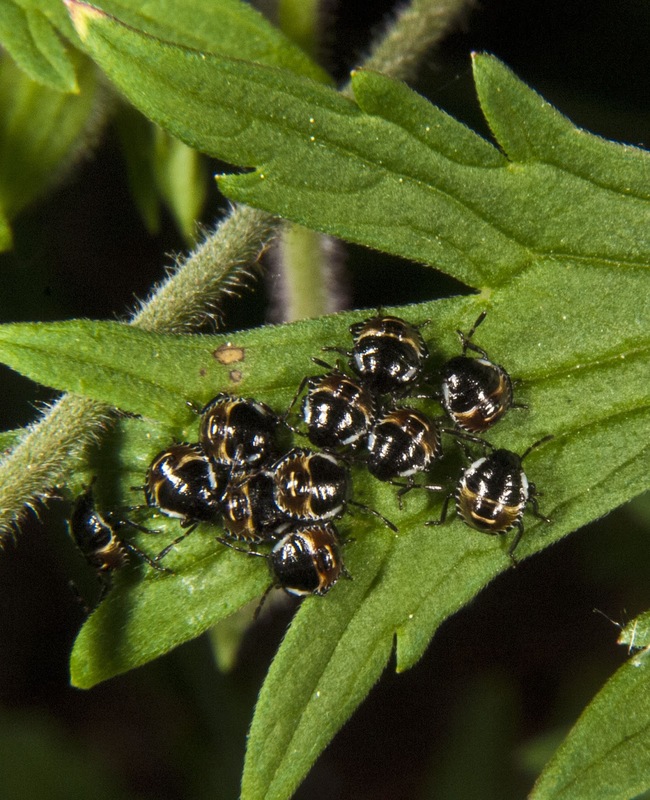 At first I was unsure of what they were, but it turns out they're immature shield bugs, the gardeners friend. Yes, these little guys will grow up to seek out caterpillars for food, hence being the gardeners friend. That's it for now, till next time. What wonderful common names some of the moths have!